Rosedale Field, located in Toronto’s Rosedale Park, is an important community and recreational area. It is historically significant as the site of the first Grey Cup game. The Toronto Argonauts were the first team to play on Rosedale Field, from 1874 to 1915. On December 4, 1909, temporary grandstands were erected to host 3,807 Grey Cup spectators. 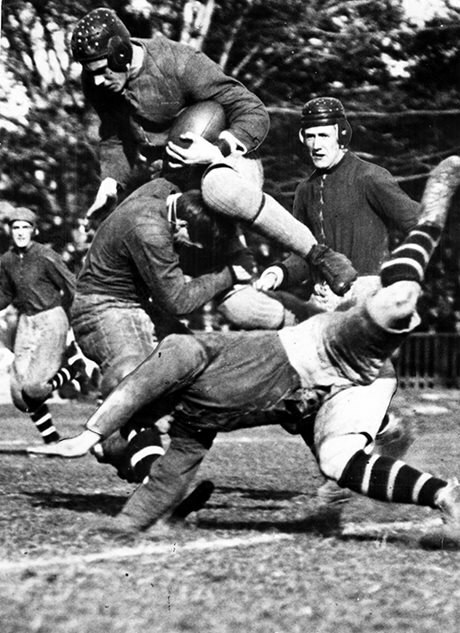 The Grey Cup game was played between the University of Toronto Varsity Blues and the Toronto Parkdale team. Lord Earl Grey, Governor General of Canada, donated a trophy to the winners – the Varsity Blues, with a score of 26-6. Since that first Grey Cup game, Toronto has hosted the event 45 more times, but at Varsity Stadium or the Rogers Centre. Rosedale Field remains an integral part of the extant park, which also includes tennis courts and a hockey rink. Visit Rosedale Park, where you can also see the Heritage Toronto plaque, at 20 Scholfield Avenue in Toronto, Ontario. Watch rare film footage from the Canadian Football League of the first Grey Cup in 1909. Read CFL honours first Grey Cup game at Rosedale Field, from the Toronto Star newspaper, May 30, 2012. Learn more about the Grey Cup from the Canadian Football League website.